Dirtnaps are inevitable in mountain bke racing. We are pinned, pushing well beyond our own capabilities and the limits of our gear, animal-brained, and hungry for the best finish we can muster. When we find ourselves rubber-side-up, wondering if we are okay to continue or if our adrenaline has filled in the gap between okay and critically injured, we have to depend on volunteer race medics. The faster those folks can get to us to asses the situation, the better off we will be. David working as lead trail medic at TranSierra Norte 2018. 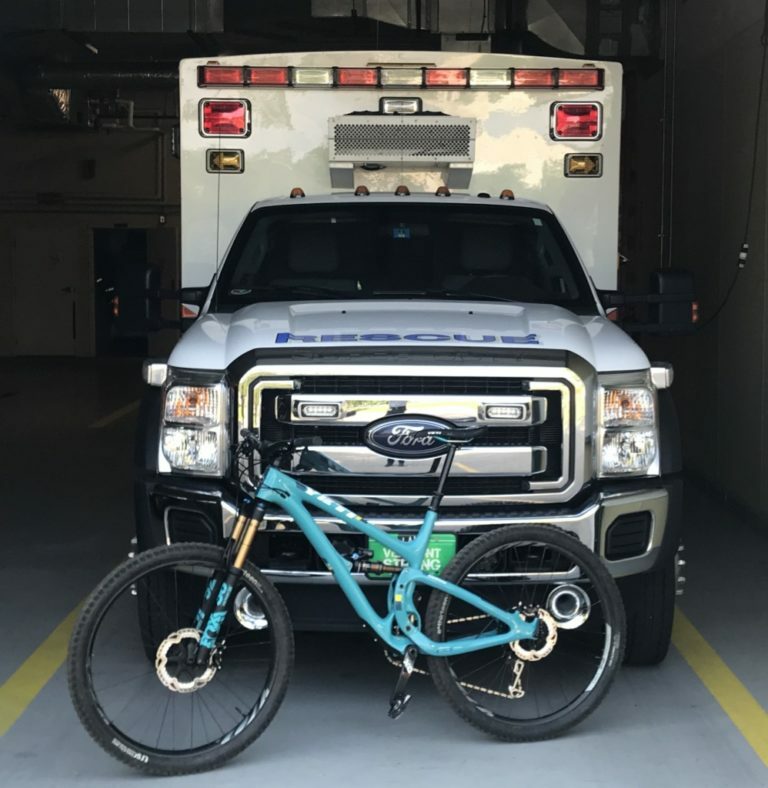 I recently chatted with professional paramedic, and volunteer race-medic, David Cohen, to learn about how mountain bike races go down from his perspective. David shares some tactics he has developed to shorten incident response times, recounts harrowing tales from alongside the trail, and describes the contents of his race day medicine bag. A former multi-day enduro racer himself, Dave is a wilderness trained ALS Paramedic from Vermont. In addition to his day job on an ambulance, he works as an on-trail medic at a variety of races. 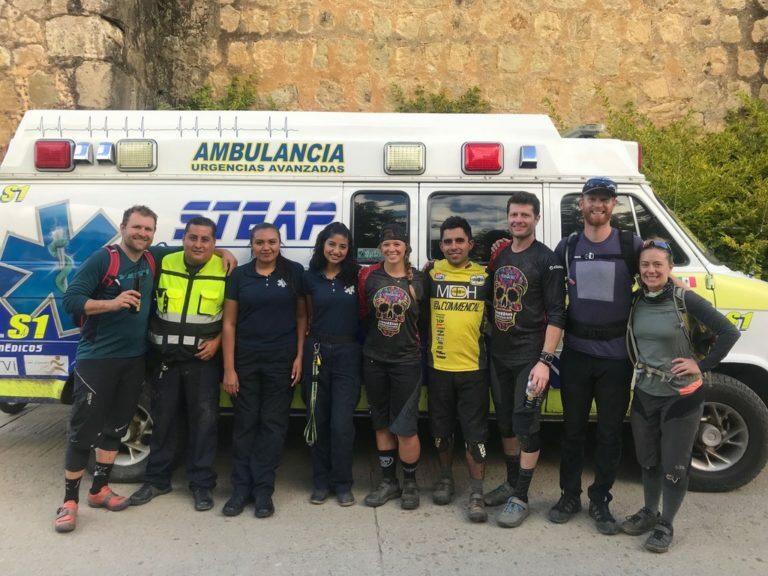 David is the lead medic for TranSierra Norte (Oaxaca, Mexico) and volunteer medic for TransBC (Western Canada), TransNZ (New Zealand), TransCascadia (Pacific Northwest), and a handful of other enduro races. He is the safety consultant for the Yeti Tribe, and a partner and consultant to BackCountry LifeLine through his company, Event Medic Consulting International, llc. Before talking with David I assumed that the medics who save lives at races are paid. They are not. I also speculated that there was some sort of organization or company that race promoters contact to hire medics. Wrong again. The first people on the scene to scrape us up and asses the damage are an ad-hoc group of volunteer professionals, brought together by informal relationships and connections. They are giving their time because they care that we get home safe. 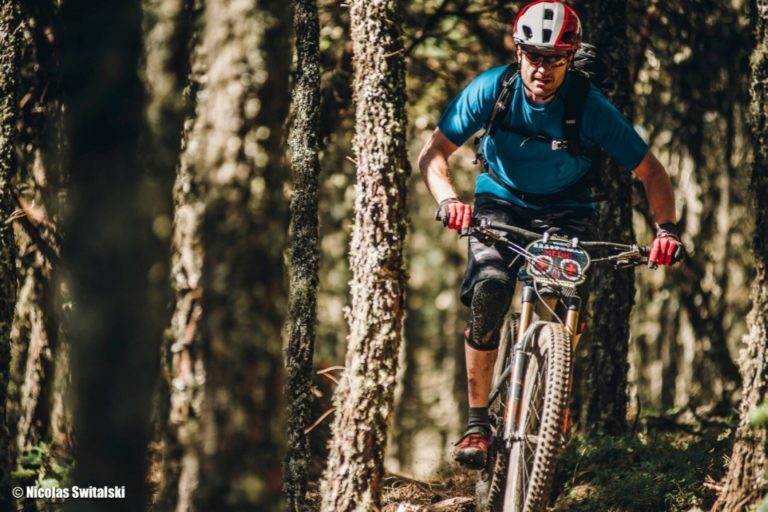 David has amassed a talented group of medics he can assemble for any given race and has become the person many large backcountry event promoters call on to work their events. Even with his high level of skill, massive dedication to planning and procedure, and team of ready professionals, he willingly does all of this work for free. TransNZ 2018 – David stationed trailside at a critical spot in the track. When a race organizer contacts David to plan how the medic team will interact with the race, he has a few critical tactics he works into the planning. The first is that all medics need to be on bikes. If a racer needs medical assistance in the middle of a 3-kilometer stage, it is far faster to have a medic ride down to them than to have someone walk the track. Faster response times help get the down rider what they need quickly and allow the race to continue without pushing against the sunset. When David is the lead medic, he has someone from his team remain at the top of each track until the last rider has gone off, sweeping the trail to make sure everyone cleans the descent safely. Another key element to David’s race day safety preparation list is communication. Each stage needs to have clear communication from top to bottom, without interruption. If a course marshal can’t radio to the medics at the top, or officials at the bottom, the radios are altogether useless. David brings a personal set of radios to each race, to be sure all of the officials and members of the medic team can stay in contact throughout the event. 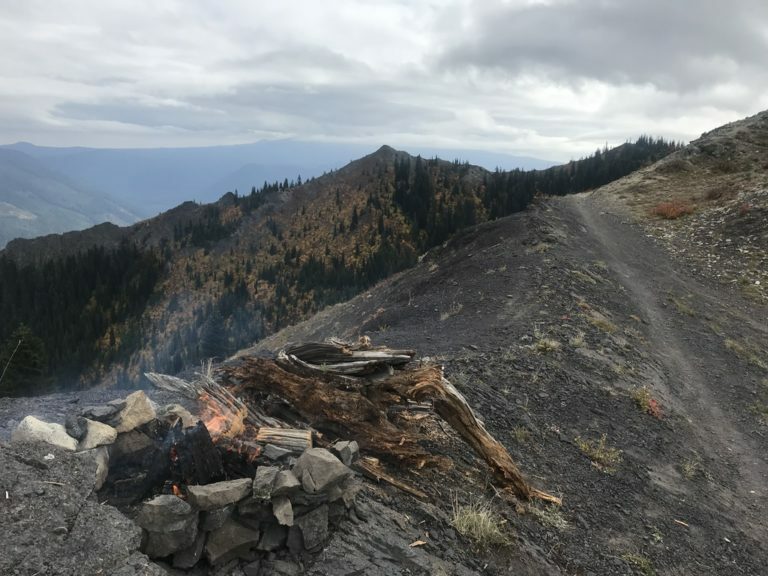 At TransCascadia 2018, David was stationed atop a stage in Gifford Pinchot National Forest, keeping warm. Once all of the logistics are set, David and his team determine which supplies they will carry during the race. For most events, the team brings their own personal medical supplies, and they carry all 20+ pounds of them on their backs throughout the day. 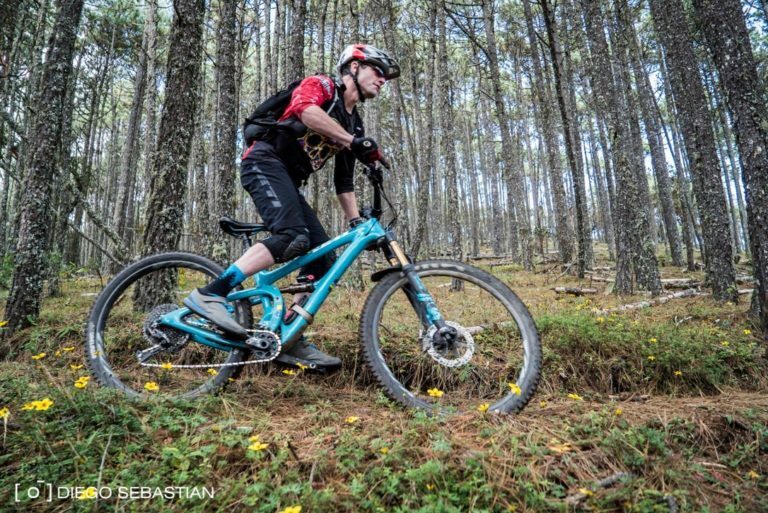 When someone goes down, the medics will ride down the same trail — with far more gear. They have to be skilled riders, able to keep a cool head and not crash while charging to help someone. Before the race, David hosts a safety briefing to inform racers of any particularly dangerous elements on the course and reminds them to make sure they have all the food, water, and clothing they will need for the long day out. He then lets them know what to do if they go down or see someone who has crashed. The short story is, they need to ask if the person is ok, and if they don’t get a response they need to stop and ask the next rider who comes by to go notify an official. 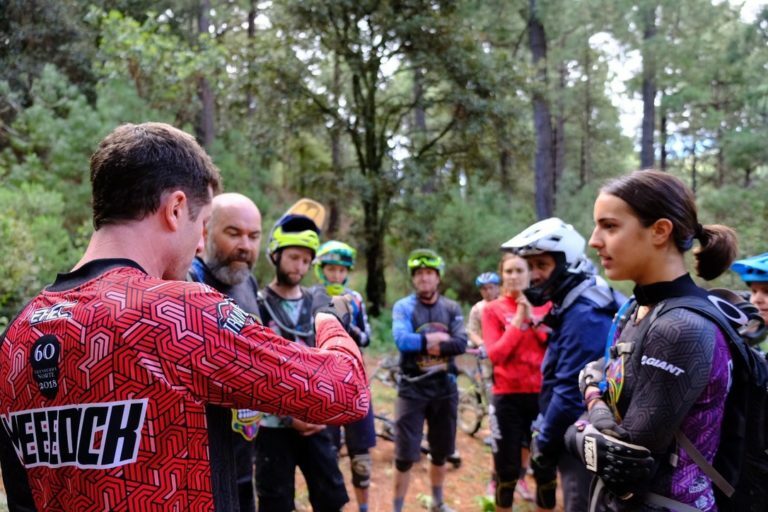 At an enduro with 30-second start splits, this means that the chain of communication is roughly one minute long by the time word reaches a medic’s radio. He informs racers that their times will be adjusted if they stop to check on someone. David told me that the worst day of a multi-day race is usually the first. Folks go out full gas thinking they will win the day. They have all of the energy and excitement they are going to have for the event boiling over and ready to rip. They tear out like house puppies let loose in the backyard and then find themselves over the bars. He said speed is the number one cause of injury. He has numerous stories of riders cleaning a super technical or steep piece of track, only to crash on the faster straight bit just after it while they are going far faster and still thinking about what they just did. He warns riders of these themes before every race, but inevitably we humans can be a predictable lot. David shared some first-hand medical emergency stories from races he has worked in order to give racers and promoters a better idea of what a race medic’s job looks like. Below are three of those stories. “Day one, stage three of a 4-day race. A racer had come upon another rider down on the trail and seemingly unconscious. They followed the safety briefing instructions, stopped with him and sent the next racer to arrive down to the next person with a radio to call for a medic. Luckily, one of the photographers was just below with a radio and he was able to call up to me. 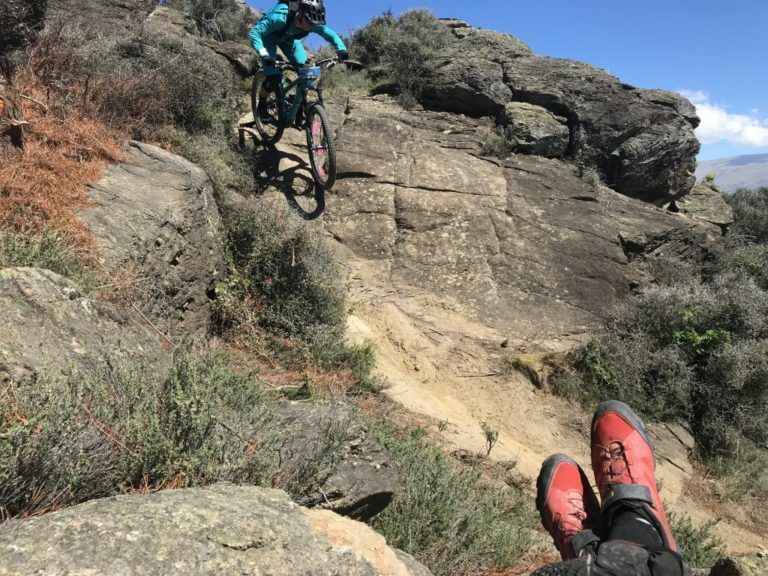 I dropped onto the trail and made it down to the rider in a few minutes, having to check my speed a few times… adrenaline kicked in for sure! Performing patient care at TranSierra Norte in 2017. “Stage one, day one of a 4-day race – the entire day was extremely remote. Particularly the first stage that was reached after several hours of transition riding up and over a huge ridgeline. [It was] just a monster day with almost no road access. I was stationed at the finish of stage one and was just packing up to ride on as the start medic had radioed that the last riders were on course and he was heading down. Several minutes later a rider came down and said there was a racer a few hundred meters up the trail off the side [who] had fallen hard onto a stump and was certain she’d broken some ribs. He also explained that another rider was with her. I hiked up to her [and] sure enough she was sitting on the ground holding her ribs, taking shallow, painful breaths in tons of pain. We were able to help her to her feet and [walking] down the trail to the finish of the stage. There, I was able to assess the side of her chest: she clearly had at least 2 fractured and displaced ribs. Along with being exceptionally painful, there was some significant risk. Ribs that have broken and are free-floating are often splintered and sharp and can puncture a lung, resulting in difficulty breathing or worse, a tension pneumothorax which can kill someone. Clearly, she was unable to ride, but we were just one stage into an immensely long day, hours by bike from where we started and even more hours and multiple ridgelines away from the finish at the camp. The closest heli-landing zone was back up at the top of the stage we’d just come down which would have taken hours for her to shuffle step up, if she could have done it at all. Luckily the course marshal at the finish was a local and knew of a side trail that would eventually bring us out to a fire road. Even more luckily, one of the other racers had already bailed out due to cramping and another medic was able to radio out to someone with a sat phone who had called camp to send a truck for him. Day one of a 4-day race, last stage of the day. Earlier in the day a rider had a minor crash that knocked the bar end cap off one side of his handlebars. He was uninjured. Later in the day, right toward the end of the last stage, he came into a rock garden too hot and got thrown off and tangled with his bike. The uncapped, sharp bar end impacted his right inner thigh, acting literally as a hole punch, puncturing his thigh in a perfect circle through the skin and deep into the muscle. Amazingly, he just missed tearing his femoral artery, my guess is by millimeters at most. If he had he done so, in all likelihood he would have bled out in minutes. Definitely, before we were able to get to him. To read more incident accounts like these, keep an eye on David’s professional Facebook page, and nudge him to put this stuff in a book at some point. What do race medics carry in their packs? This list includes most of the gear David and his team carry in their packs for any given race. For hotter races or events with different insect or plant concerns, the list can grow longer. Are on-trail medics like David the wave of the future? Let’s hope so. Maybe we should start paying for their vital services? 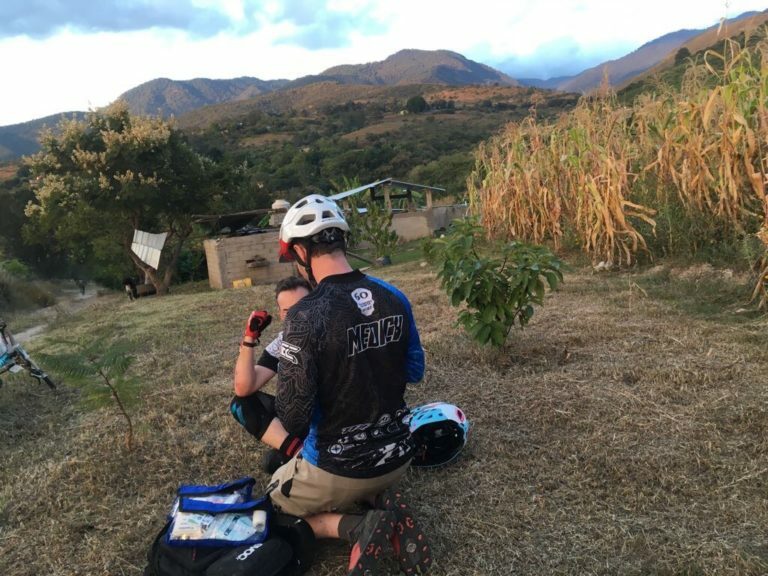 David and many other medics are working to improve the care they can provide out on the trail, both by asking that racers be required to attend first-aid courses like those put on by Backcountry Lifeline, and creating better practices to ensure the safety of all riders. There are a handful of race medics building companies, organizations, standards, and regulations around the types of safety and medical procedures that both race promoters and medics need to have in place at events, but this process is in its infancy. For now, we have to be thankful that these fantastic folks give their time, energy, expertise, and supplies. The races David works are all non-UCI. If you would like to read the UCI regulations on medical staff and first-aid requirements, there are a few sentences on the subject in this official UCI document. We would like to thank David, and all of the dedicated race paramedics out there, for working to keep us safe.